In a medium bowl, mix the pineapple, strawberries, blueberries and kiwis together. In a small bowl, combine 1 cup of yogurt with the strawberry fruit spread. In a separate small bowl, combine 1 cup of yogurt with the blackberry fruit spread. Using 4 tall sundae glasses, place ¼ cup of the strawberry yogurt in the bottom of each glass, followed by ½ cup of the fruit and 2 tablespoons of granola. 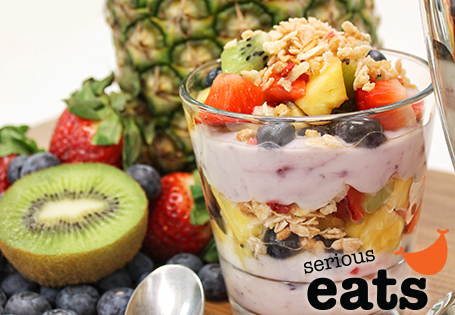 Repeat with ¼ cup of the blackberry yogurt, ¼ cup of fruit and remaining granola. TIP: If you prefer stronger fruit-flavored yogurt, add additional fruit spread.